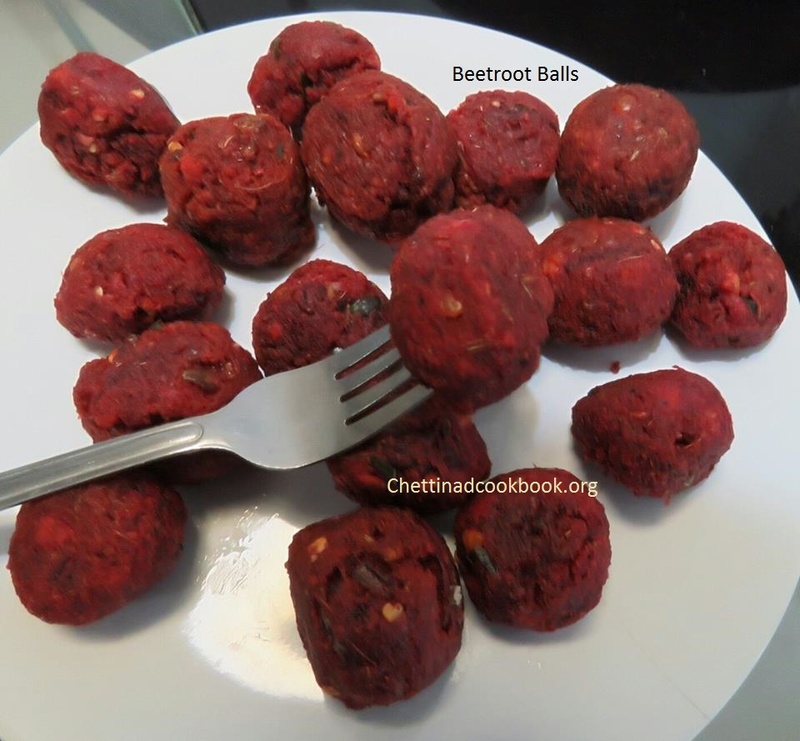 Authentic Chettinad recipe Beetroot Kola Urundai is one of their delicious mouth watering recipe. Alluring recipes from Chettinad and their hospitality makes more interesting to admire. 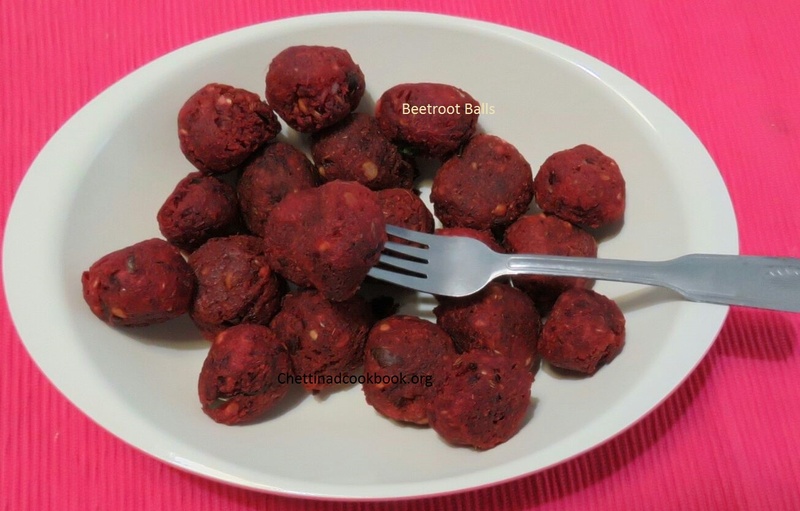 Beetroot kola urundai has crispy outer layer, soft and spongy inner part prepared with soaked dal and aromatic spices blend together. 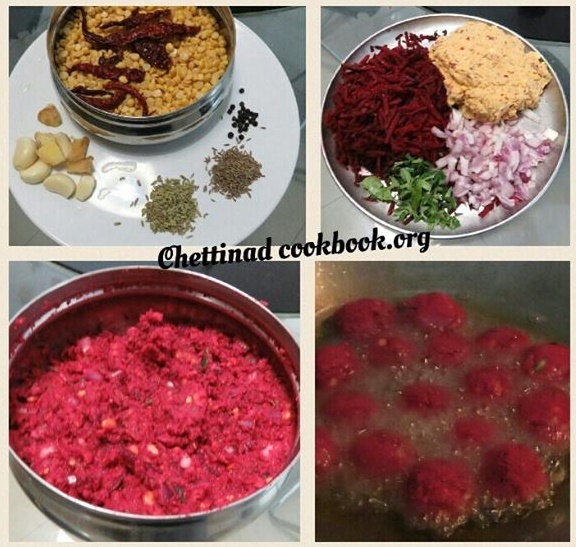 Protein rich dal and beetroot give a wonderful scrumptious taste. Easy to prepare, serve with any combination of meals or as a starter. Wash and soak toor dal and channa dal for an hour. Coarsely grind the above mentioned “To Grind” ingredients with soaked dals. Do not add water, let the mixture be thick. Wash, peel and grate the Beetroots. Set aside. Take a wide bowl, mix all ingredients with 1/2 tsp of salt. Make the mixture into small balls. Heat oil and fry 3 minutes in medium flame and 2 minutes in low flame.This mixture has to be fried as soon as they are mixed, else it becomes watery when stored. Drain on paper towels. Drain water completely from dal before grinding. Chop onion and curry leaves to a fine pieces which make the mixing process easy. Grate beetroot or coarse grind the chopped beetroot pieces. In case of more watery add some gram dal or rice flour to thicken the mixture (texture and taste may have slight difference).